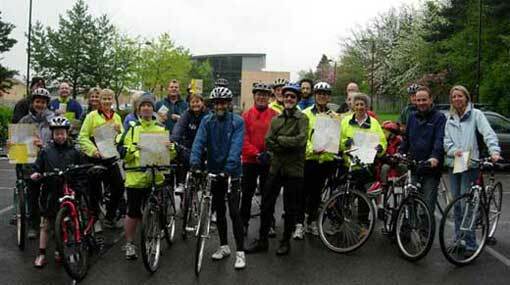 tremendous start when the first ride on Sunday 7th May attracted 35 cyclists of all ages and abilities. The group met at 10.30am at Hornbeam Park Railway Station. The riders – some of whom hadn’t ridden a bike for years while others were highly experienced and one was about to go to Italy to compete in a mountain bike race! – were welcomed by organiser Malcolm Margolis who said the purpose of the group was to encourage more people to enjoy the pleasures and benefits of cycling, both for leisure and for practical purposes such as going to work and school. He emphasised that safe cycling was the top priority. A report of the ride would be emailed to all those taking part, and would also be posted on the website www.wheel-easy.org.uk which should be fully operational during the coming week. He hoped some of the more experienced cyclists would become Wheel Easy! ride leaders and asked everyone to come forward in due course with any suggestions they had to help the group develop. Ride leader Dave Preston described the route for this initial gently paced ride, which would be to Knaresborough and back to Hornbeam Park, a total of around 10 miles. He then led the riders off, with other experienced cyclists in the middle and at the rear of the ‘pack,’ along to the end of Hornbeam Park Avenue, left through gates into the field leading to Hookstone Woods, and up the track to Hookstone Drive. Using the cycle track alongside this busy road, the group negotiated the traffic lights to cross the Wetherby Road at Woodlands corner, down the hill to the bottom of Hookstone Chase and then round the roundabouts into Forest Moor Road. As luck would have it, the overnight rain which had held off as we gathered at the start, returned with increasing strength from the moment we set off, and by this stage we were all getting fairly soggy. However, with true Yorkshire grit, we pedalled on. At the far end of this we turned left into Calcutt and down Blands Hill into Knaresborough, a fairly nerve wracking section for the inexperienced but manageable by all with proper care. There are many remarkable things about her on this web page, but from the point of view of Wheel Easy! the most remarkable discovery was that she died (while riding her bike) on 5th May 1996. So our inaugural ride, which included the cycle route built in her honour, was as near as could be the 10th anniversary of her death. I found this coincidence almost spooky, and, one hopes, a great omen for the future of our group. From the top of the Beryl Burton Way we stopped for a few photos, and then went left to the end of Bilton Hall Drive, and briefly right along the cycle path to Bogs Lane, past Henshaws College to Kingsley Drive. Further quiet residential roads brought us to the Stray at Granby Road. We crossed the A59 in ‘batches’ using the pedestrian traffic lights and used the diagonal carriage road opposite Church Square to access to St Winifreds Road, St. Hilda’s Road and Oatlands Drive. Finally, we coasted down Wheatlands Road East to Rayleigh Road and back to our starting point at Hornbeam Park. This is the ride report, which is already long enough, so apart from adding a couple more photos below, I will end here and send everyone a further email in a day or 2 regarding taking the group forward. I will also email information during the week (if I have any) about next Sunday’s ride. However, please note that unless the weather is very poor we will meet again at 10.30am at Hornbeam Park Railway Station. I do hope some of you will reply in the meantime with your suggestions for next week, and any other thoughts on the future of Wheel Easy! Thank you again for your support for the inaugural ride, and I hope very much that we will cycle together again many times in the future.